My mother, a retired schoolteacher, is an accomplished watercolorist, and I recall her not-all-that successful attempts a half-century ago to instill in my brother Matt and me a love of painting. When we were quite young, she drove us to the north side of our city, near where the fishing boats were moored, and when I came home I painted a rust-colored box car. Some years later, in elementary school, I executed a passable football player. But whatever enthusiasm I had for drawing and painting soon was eclipsed by my obsession with sports. It wasn’t until my senior year in college, when I spent the autumn term in Cologne, Germany, that I discovered art. At twenty-two, I was not a discriminating viewer. It was the sheer oldness of the things that attracted me. One weekend, near the end of my term, I took a night train to Paris, and my initial destination was the Louvre, the superstore of art museums. It was as if I were a contestant in the late-sixties TV show Supermarket Sweep—the ostensible goal being not 16-pound frozen turkeys but to visually consume as many masterpieces as time allowed. And it was here that I encountered the Mona Lisa, smiling thinly through her bulletproof glass. Seven years later Paula and I shared an apartment in Hamburg, close to one of the city’s many canals, for the better part of a year. In just about every city we visited—Berlin, Amsterdam, Heidelberg, Strasbourg—we went to a museum or art gallery. Last September, thanks to the generosity of a friend, I returned to central Europe, almost certainly my last trip beyond North America. While my friend and I were in Berlin, I visited the city’s museum devoted to Salvador Dali, the Spanish surrealist best known for his melting timepieces and other jarring images. The work that most drew my attention was an ink-on-paper drawing depicting Jesus on the cross being buffeted by a storm of nails, as if his crucifixion was being carried out by hand grenade. Despite Dali’s reputation as a whimsical genius, and his many paintings of voluptuous nudes, he also inherited from his Catholic mother an appreciation for Christian iconography. 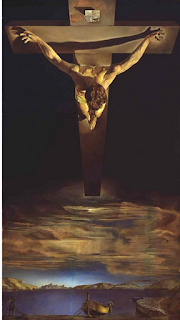 One of Dali’s most admired paintings is Christ of Saint John of the Cross. The perspective of the painting looks down on the saint’s long muscular arms and shoulders. At the bottom of this steeply vertical painting, Jesus’s disciples are casting their nets on the Sea of Galilee. According to a website devoted to Dali [dalipaintings.net], the painting was inspired by a sixteenth-century drawing, preserved in the Convent of the Incarnation in Avila, Spain. Keep in mind that this is an artist who titled another one of his paintings The Great Masturbator. Dali’s imagination encompassed multitudes. Last Friday, Paula and I, along with several other people who have Alzheimer’s or a loved one who does, visited the Boston Museum of Fine Arts’ exhibit “Making Modern.” The tour was organized by the local chapter of the Alzheimer’s Association, which regularly organizes trips to cultural institutions as well as arranging outdoor activities. After breaking into groups, we were provided a guided tour of modernist painters, starting with Pablo Picasso and Jackson Pollock. We spent a good deal of time discussing vaguely similar paintings from the two masters. As our docent pointed out, there are tonal similarities among the two painters. Pollock, the most famous of the abstract expressionists, was the first painter to splatter paint onto a canvas, rather than painting with a brush. In the ensuing discussion, we were asked to find commonalities between one of Pollock’s works and Picasso’s. One thing we came up with was the use of similar pale-greenish earth tones. The “Making Modern” exhibit also includes paintings by such well-known artists as Georgia O’Keefe, who did much of her painting in the arid southwest, as well as the great Mexican painter Frida Kahlo. Lesser known to me was Arthur Dove, now regarded as America’s first abstract painter. But as our docent pointed out, his influence has been broad. The docent also introduced us to a new piece in the MFA’s collection by local African American artist Lois Mailou Jones, a work that is half collage and half painting, portraying the famous African American dancer Josephine Baker. We ended with a viewing of Kahlo’s double portrait, which was the first painting she ever sold. Holding a party to celebrate the painting’s sale, Kahlo asked her friends to sign the back of the canvas, and their signatures can still be seen, very faintly, today, thanks to the museum’s display of both sides of the painting. Over the last twenty years, half of all state legislatures have legalized marijuana for medical purposes, such as controlling nausea among cancer patients. But recently I came across a notion about marijuana that struck me as counterintuitive: The drug’s active ingredient in marijuana, THC, may benefit people with Alzheimer’s. I was not much of a pot smoker as a teen, but I partook enough times to learn that, unlike alcohol, the effect could be unpredictable. In April 1979, a couple of friends and I drove the 90 miles to Seattle for the day, and I was driving my dad’s gas-guzzling Chevrolet Malibu. Driving under the influence, be it alcohol or marijuana, is never a good idea, but my timing was especially bad. When I noticed that we were low on gas, I found my way to a gas station, but it was nothing like I had ever seen. There were multiple lines of at least a half-a-dozen cars ahead of us, and the lines showed little sign of advancing. I was seventeen, the second energy crisis was at its peak, and I interpreted the unmoving line of cars as an omen that civilization, like Jimmy Carter’s presidency, was collapsing. If I were to smoke pot these days, or, more likely, to absorb the THC orally, I imagine it would be an act of piling mild confusion on top of mild confusion. It is not unusual for me to forget why I entered a room by the time I get there. But according to a press release earlier this summer from the San Diego-area Salk Institute, THC can promote “the cellular removal of amyloid beta”—also known as plaque, and assumed to be a key element in the progression of Alzheimer’s. “Cellular” is the key word. The Salk team studied nerve cells altered to produce high levels of amyloid beta to mimic aspects of the disease. “The researchers found that higher levels of amyloid beta were associated with cellular inflammation,” the press release noted. While the tests involved neurons grown in laboratories, “they may offer insight into the role of inflammation”—a much-discussed topic among Alzheimer’s researchers. While other studies have suggested that cannabinoids, THC in particular, offer protection from the symptoms of the disease, “We believe our study is the first to demonstrate that cannabinoids affect both inflammation and amyloid beta accumulation in nerve cells,” according to David Salk. This was treated as good news, and I assume that in some abstract way, it is. But as I was reading through my notes, I was hoping for something less ambiguous than Currais’s cogent but not particularly promising remark. The deflating word is “may.” So broad in implication. So unlikely to be fulfilled through a cure anytime soon. Last month I referred briefly to the 1981 movie On Golden Pond, which I became acquainted with when I was a sophomore in college. Many people remember the film because it was a rare instance of family members being chosen or nominated for Oscars or Golden Globes in the same movie. As I watched the movie recently, the signs were startlingly clear. After Norman enters his cabin, he looks disconcertingly in a mirror, as if he doesn’t recognize himself. When he pushes the door to go onto his deck, the door collapses. He stares at a family photo and asks himself, “Who the hell is in this picture?” Then he tries to use the phone. The operator asks him for his phone number, but he can’t recall it. When he goes to the pond’s marina (he purports to be looking for a job), he chews out a couple of teenagers who work there. For an instant, he has his fists up, and when he departs, the two kids smirk. Later, Norman insults his nice-as-could-be mailman by suggesting that it was he, not Norman, who knocked down the door to the deck. 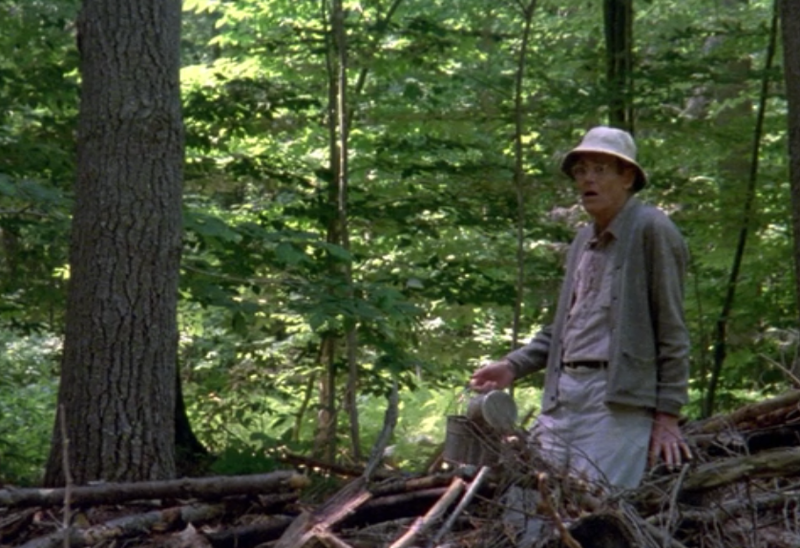 One reason why critics may have overlooked the dementia theme was that, in the second half of the movie, Norman is much more engaged than he was at the movie’s start. But this, too, is plausible. When Norman’s daughter, son-in-law, and thirteen-year-old grandchild arrive, Norman, after an initial awkward period, benefits from the social stimulation, particularly through his bonding with the grandchild. I also wonder if the studio might have worried about showcasing a disease that in the early eighties was still rarely talked about. 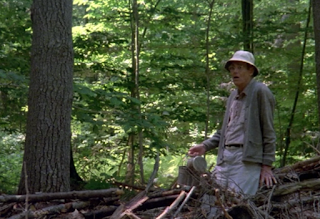 I’m not the first person to comment on the lack of references to Alzheimer’s, subtle or obvious, in On Golden Pond. 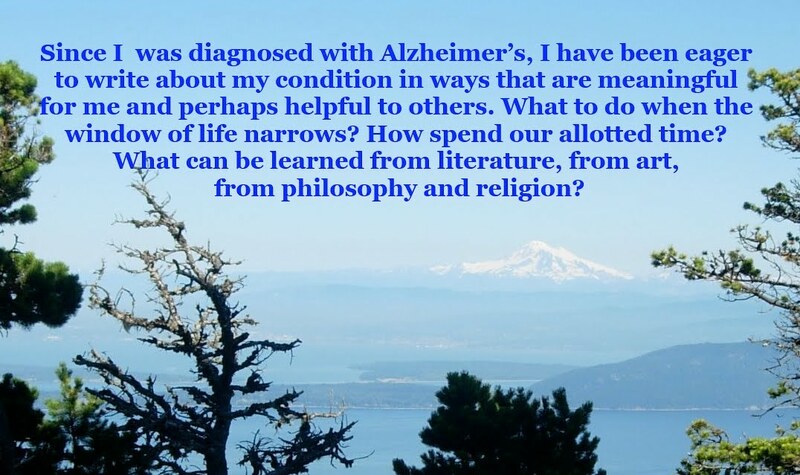 About five years ago, Shelley Webb, writing on her blog The Intentional Caregiver, titled one of her posts “On Golden Pond: A Lesson in Dementia Care.” Dementia, Webb noted, “was often thought of as a part of aging and referred to senility, as something that was expected of old people. Seldom was the fear that the person with the memory loss experienced spoken of.” In this regard, we still have a way to go. A couple of days after the Democratic convention concluded in Philadelphia on July 30, I was pleasantly surprised to learn that the event had included a panel discussion on Alzheimer’s disease. One might have thought that the Republican Party would have done the same. After all, Ronald Reagan, often regarded as the most popular Republican president of the twentieth century, may have been showing symptoms of Alzheimer’s while still in office. One of his sons has suggested that this was the case as early as 1984, more than four years before he left office. The bill also would enable Medicare to reimburse doctors. “But here’s the best part,” Stabenow announced. “I’ve been working with the Health and Human Services department and Medicare and Medicaid, urging them to do it administratively”—basically an end run around a Congress that has done little to concern itself with public health. “It’s no secret that there are many of my colleagues who just want to keep cutting things because government [is perceived] as the problem,” Stabenow said. Blumenauer, the House member from Oregon, suggested that it may not be essential to find a cure for Alzheimer’s for progress to result; slowing down its progress could buy some time for a cure. “If we are able to delay the progress by five years, we can cut in half the trauma,” he said. This is not the first time that the Democrats have highlighted a neurological disease at their convention. Back in 2004, the actor Michael J. Fox, who had been diagnosed with Parkinson’s before he turned thirty, called for rescinding the prohibition on federal funding for stem-cell research. Opponents objected because the cells would be derived from human embryos. Soon after Barack Obama became president in January 2009, the prohibition on stem-cell research was rescinded.